The original Land Rover had a very successful first decade, but by the late 1950s it was clear that changes had to be made if it was to remain the top dog. Hence, the Land Rover Series II was launched in 1958 sporting a larger petrol engine and new styling. The new petrol engine was based on the recently introduced diesel engine. Engine capacity was bored out to 2.286l, to produce 52bhp at 4,000 rpm and 101 lb/ft torque at 1,500 rpm. This was comparable to the diesel, although the diesel engine revved at a lower speed, and was only capable of 87 lb/ft torque at 2000 rpm. The new gearbox was similar to the Series 1 gearbox, but incorporated synchromesh on the 3rd and 4th gear. Rear wheel movement was improved by moving the rear springs, and the turning circle was reduced by improving the steering lock. The new body styling was still conservative, but added rounded corners and sills to the Land Rover design. Window perspex was replaced with glass. The Series II sold well, with 28,000 being sold in its first full year, and 34,000 in the year after. In 1961, the diesel engine was bored out from 2.052l to 2.286l to match the petrol engine. Although the change in diesel option was the only significant change, the Series II was renumbered as IIA. The first 12-seat station wagon was introduced in 1962. Twelve adults would have been a tight squeeze, but it allowed the vehicle to be classed as a bus and avoid purchase tax. The cheaper price hit sales of the more expensive 10-seat 107" station wagon in the UK market, and the 107" was finally dropped from the product range. The next major change occurred with the introduction of a 2.625l 6-cylinder petrol engine option on the 109" models in 1967. This engine had been developed for the Rover P4 and P5 cars, but was introduced into the Land Rover range to supply extra power for the anaemic Forward Control 2A. The dashboard is also re-designed in 1967. Export models had their headlamps moved from the grille area to the wings in 1968. This change was reflected in domestic models a year later. 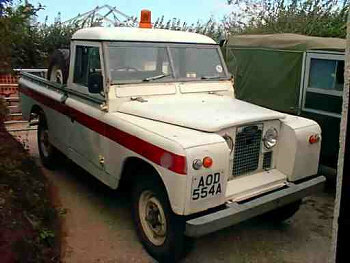 Another change in 1968 was the introduction of the "1-ton" Land Rover. Externally, this looked identical to the standard Series IIA 109" ( "3/4 ton" ) Land Rover, but was upgraded in a number of areas to handle heavier loads and towing. The most notable upgrade was the use of heavy duty transmission components from the Forward Control models. Overall gear ratios were also lowered to aid with towing. As with the Series I a decade earlier, by the late 1960s it was clear that significant changes were required if Land Rover was to keep its edge. Hence in 1971, the Series IIA was replaced by the Series III. Series IIA pickup: © Giles Warham.